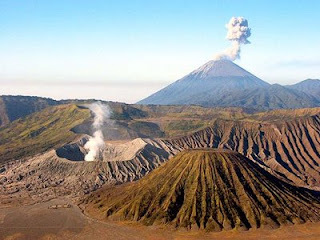 Mount Bromo is one of five volcanic mountain complex located in the Tengger Mountains in the ocean sand. The attraction of this mountain is a mountain that is still active. Sightseeing Mount Bromo is a natural phenomenon with a specificity of natural phenomena that are not found elsewhere is the presence of craters in the middle of the crater (in the creater creater) with a stretch of sea sand that surrounds it. The eruption of Mount Krakatoa never shake the earth. This volcano has erupted on August 26, 1883. Explosion is very powerful and also cause a tsunami that killed about 36,000 people. Krakatau eruption voice to be heard in Alice Springs, Australia and the island of Rodrigues near Africa. 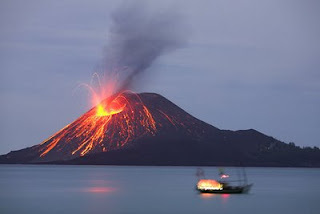 Mount Krakatau in the Sunda Strait between Java and Sumatra. Even the dust is said to get to outer space. Although Krakatoa was not as dangerous as it used to be (hopefully) but its history is one of the natural wonders of its own.